In part two, I will look at the actual implementation – there are still a lot of pitfalls in making this work in real life. PS. If you enjoy technical stuff like this, please leave a comment. I can’t say I know too much about the technical details of image processing, but I do appreciate the insight post like these give. Thanks! It seems like you could reduce the size further is you used a different data type for the LUT, for instance a 16-bit or 8-bit int. With my monitor at 1024 pixels high, I couldn’t imagine being able to enter a curve at more than 10-bits precision, and that’s if the screen is maximized. Sounds like the image data is in float, but does it take too many cycles to cast an int to a float? I wonder if the loss of precision would be noticable. Anyways, these are just questions floating in my head, and I’m not trying to criticize your implementation, you folks know way more than I ever will about this stuff. The game is a little different when you are dealing with Raw data, because you operate in a linear colorspace. Because of this you need additional precision, since errors become very visible in dark areas. Yes, I enjoyed this posting very much. Thanks! The problem with that approach is that decreasing the table precision leads to at least two problems. First, the curve downscaler 65536->256 has to be chosen carefully. And then such a big downscale can’t be reasonably inversed using a simple linear interpolation w/o introducing aliasing problems. Do you have some PSNR numbers comparing the original results using interpolation between the 65536 sampling points of the curve, and the faster 256 entry table interpolation ? >First, the curve downscaler 65536->256 has to be chosen carefully. 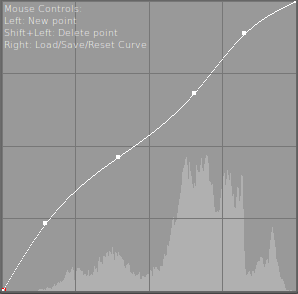 The curve isn’t downscaled as such – the curve is simply sampled with 256 entries instead of 65536. So we get 256 exact values, and not some that are derived from 65536. >And then such a big downscale can’t be reasonably inversed using a simple linear interpolation w/o introducing aliasing problems. How do you get to that result? The curve is an input->output mapping, where neutral is input=output (straight line). You would have to have a curve that has variations where the correction is changed at a 1/128th pixel resolution, which simply wouldn’t make sense. So unless you have information with a frequency close to or above the nyquist frequency, a linear interpolation should not generate aliasing. If you consider the image of the curve, you have approximately the horizontal resolution of the image (the image is ~290 pixels wide). The vertical sample point have float point precision, so the vertical resolution is very precise. The vertical resolution is the reason there is no precision issues, even with such small tables. >Do you have some PSNR numbers comparing the original results using interpolation between the 65536 sampling points of the curve, and the faster 256 entry table interpolation ? I’ll make a few calculations that calculates the min, max and average error on “realistic” and some “extreme” curves.